Microwave trucks seen transmitting. Modern news employs these trucks extensively. 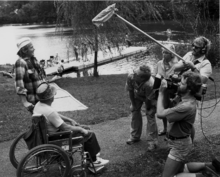 On location outside Baltimore, cameraman Jim Furrer, sound recordist Bill Porter, and director David Ryan interview participants in a public rowing clinic as part of an early electronic journalism shoot in the 1980s. Electronic news-gathering (ENG) is a broadcast news industry description of television producers, reporters and editors making use of electronic video and audio technologies for gathering and presenting news. The term was commonly used in the television news industry in the 1980s and 1990s, but it has since been less frequently used as the technology has become ubiquitous. Electronic news-gathering can involve anything from a lone reporter taking a single professional video camera out to shoot a story, to an entire television crew taking a production or satellite truck on-location to conduct a live news report for an outside newscast. 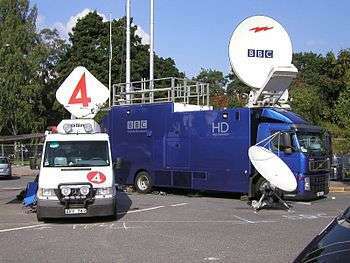 The vehicle on which the electronic equipment is fitted is called DSNG (Digital Satellite News Gathering). The term ENG was created as television news departments moved from film-based news-gathering to electronic field production technology in the 1970s. Since film requires chemical processing before it can be viewed and edited, it generally took at least an hour from the time the film arrived back at the television station or network news department until it was ready to be broadcast. Editing was done by hand on what was known as "color reversal" film, usually Kodak Ektachrome, meaning there were no negatives. Color reversal film had replaced black-and-white film as television itself evolved from black-and-white to color broadcasting. Filmo cameras were most commonly used for silent filming, while Auricon cameras were used for filming with synchronized sound. Since editing required cutting the film into segments and then splicing them together, a common problem was film breaking during the newscast. News stories were often transferred to bulky 2-inch videotape for distribution and playback, which made the content cumbersome to access. Film remained important in daily news operations until the late 1960s, when news outlets adopted portable professional video cameras, portable recorders, wireless microphones and joined those with various microwave- and satellite truck-linked delivery systems. By the mid-1980s, film had all but disappeared from use in television journalism. One of next-generation ENG mini-truck fleet of ABS-CBN. Since ENG reduces the delay between the capturing of the footage and its subsequent broadcast, this allowed the news gathering and the reporting process to become one continuous cycle, with little pause between arriving at the site of a news story and putting the story in question on the air. 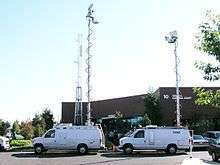 Coupled with live microwave and/or satellite trucks, reporters were able to show live what was happening, bringing the audience into news events as they happened. CNN launched in October 1980, as ENG technologies were emerging. The technology was still in its developmental stages, and had yet to be integrated with satellites and microwave relays, which caused some problems with the network's early transmissions. However, ENG proved to be a crucial development for all television news as news content recorded using videocassette recorders was easier to edit, duplicate and distribute. Over time, as editing technology has become simpler and more accessible, video production processes have largely passed from broadcast engineers to producers and writers, making the process quicker. However, initially the ENG cameras and recorders were heavier and bulkier than their film equivalents. This restricted the ability of camera operators from escaping danger or hurrying toward a news event. Editing equipment was expensive and each scene had to be searched out on the master recording. Using technology such as multicast or RTP over UDP, these systems achieve similar performance to high end-microwave. Since the video stream is already encoded for IP, the video can be used for traditional television broadcast or Internet distribution without modification (live to air). As mobile broadband has developed, broadcast devices using this technology have appeared. These devices are often more compact than previous technology and can aggregate multiple mobile data lines to deliver a high definition-quality content live. The ongoing Technological evolution of broadcast video production equipment can be observed annually at the NAB Show in Las Vegas where equipment manufacturers gather to display their wares to people within the video production industry. The trend is toward lighter-weight equipment that can deliver more resolution at higher speeds. There has been an evolution from Film to Standard-definition television, High-definition television and now 4K. As of 2016, highlights included Unmanned aerial vehicles aka drones for the delivery of aerial footage, various lines of cameras that can deliver 4K resolution, graphics packages for news stations, which can be utilized inside their microwave and/or satellite vehicles, Wireless technology, POV cameras and peripherals from GoPro and other Action camera manufacturers, and the Odyssey 7Q+ monitor with Apollo multi-camera switcher/recorder from Convergent Design. This monitor fits on the back of a broadcast video camera and allows photojournalists to live-switch a multi-camera production in studio or on location. Outside broadcasts (also known as "remote broadcasts" and "field operations") are when the editing and transmission of the news story are done outside of the station's headquarters. Use of ENG has made possible the greater use of outside broadcasts. "Some stations have always required reporters to shoot their own stories, interviews and even standup reports and then bring that material back to the station where the video is edited for that evening's newscast. At some of these stations, the reporters sometimes even anchor the news and introduce the packages they have shot and edited." Short-form news stories are what local news reporters deliver to their stations. Longer-form stories about the same topics are covered by national or international broadcast news magazines such as Dateline NBC, 20/20, Nightline, 48 Hours, 60 Minutes and Inside Edition. Depending upon the scope of the story, the number of crews vying for position at the story venue (press conference, court house, crime location, etc.) can potentially be dozens. Natural disasters, terrorism, death and murder are topics that reside at the top of the news-gathering hierarchy. For instance, in the U.S., the series of events culminating in what would thereafter be known as 9/11 galvanized every news division of every network. "Especially on that first day, you were really just going to whomever had a piece of information," says "48 Hours" executive producer Susan Zirinsky, whose team produced the primetime coverage that first night. "You were getting cameras up, you were putting people in place, you were trying to wrap your brain around it. You wanted to step back and synthesize some of the information, which is what we were trying to do ... At that point, we thought there were many more dead, and it was still a search-and-rescue mission. It was a very, very complicated day to try to give context to." "There is a hierarchy of news. It's a hierarchy of judgment, I guess. All deaths are equal to the victims and their families. But all deaths are not equal in the calculation of news value." "Feel-good stories" such as the homecoming of a military parent, saving of a life, or selfless act of kindness, sometimes make their way into the news stream. In the United States, there are ten ENG video channels set aside in each area for terrestrial microwave communications. Use of these channels is restricted by federal regulations to those holding broadcast licenses in the given market. Channels 1 through 7 are in the 2 GHz band and channels 8, 9 and 10 are in the 2½ GHz band. In Atlanta for example, there are two channels each for the four news-producing television stations (WSB-TV, WAGA-TV, WXIA-TV, WGCL-TV), one for CNN, and another open for other users on request, such as Georgia Public Broadcasting. Traditionally, the Federal Communications Commission has assigned microwave spectrum based on historic patterns of need and through the application/request process. With the other uses of radio spectrum growing in the 1990s, the FCC made available some bands of spectrum as unlicensed channels. This included spectrum for cordless phones and Wi-Fi. As a result, some of these channels have been used for news gathering by websites and more informal news outlets. One major disadvantage of unlicensed use is that there is no frequency coordination, which can result in interference or blocking of signals. A common set-up for journalists is a battery operated cassette recorder with a dynamic microphone and optional telephone interface. With this set-up, the reporter can record interviews and natural sound and then transmit these over the phone line to the studio or for live broadcast. Electronic formats used by journalists have included DAT, MiniDisc, CD and DVD. Minidisc has digital indexing and is re-recordable, reusable medium; while DAT has SMPTE timecode and other synchronization features. In recent years, more and more journalists have used smartphones or iPod-like devices for recording short interviews. The other alternative is using small field recorders with two condenser microphones. Jonathan Higgins (2004). Introduction to SNG and ENG Microwave. Focal Press. ISBN 0-240-51662-1. Jonathan Higgins (2007). Satellite Newsgathering (2nd ed.). Focal Press. ISBN 0-240-51973-6. Fredrick Shook. The Process of Electronic News Gathering. Morton Publishers. ISBN 0-89582-082-X. Gary Anderson (1984). Video Editing & Production: A Professional Guide. Knowledge Industries. ISBN 0-86729-114-1. Charles Bensinger (1982). The Video Guide (3rd ed.). Sams Publisher. ISBN 0-672-22051-2. Charles Bensinger (1979). Video As a Second Language: How To Make A Video Documentary. VTR Publishers. ISBN 0-915146-06-1. Gerald Millerson (1983). Video Camera Techniques. Focal Press. ISBN 0-240-51225-1. William Wood. Electronic Journalism. Columbia University Press. ISBN 0-231-02875-X. Milton Feinberg (1970). Techniques of Photojournalism. Wiley-Interscience. ISBN 0-471-25692-7. Clifton C. Eden (1980). Photojournalism: Principles & Practices (2nd ed.). Wm.C.Brown. ISBN 0-697-04333-9. Wilson Hicks. Words & Pictures: An Introduction to Photojournalism. Ayer Co. Pub. ISBN 0-685-32645-4. Frank P. Roy. Photojournalism: The Visual Approach (Illus). PH. ISBN 0-13-665548-3. Frederick Shook and Dan Latimore. The Broadcast News Process (Third ed.). Morton Publishing. ISBN 0-89582-164-8. Ted White and Meppen (1984). Broadcast News, Reporting & Production. Macmillan Press. ISBN 0-02-427010-5.